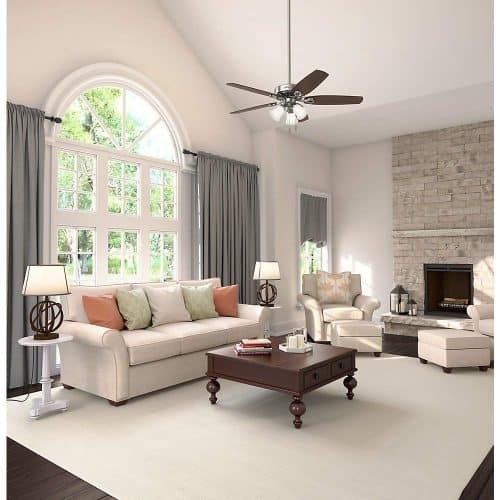 The Hunter 53237 is a member of the Hunter Builder Plus family of ceiling fans, a product brought to you by the Hunter company, established in 1886. The 5 blades come in Brazilian Cherry or Harvest Mahogany. Light fixtures are also provided, with swirled marble shades to impart diffused light to the surroundings. The metallic parts including the shank covers have a brushed nickel finish. Suitable for large rooms, the Hunter Builder Plus can be used in a room with an area of up to 485 sq. feet. The motor is reversible which provides an updraft option for allowing for upwards circulation of air during cold weather. You can also opt for just the ceiling fan without the 3-bulb candelabra. This ceiling fan is aesthetically pleasing to look at and comes in pleasing shades of Brazilian Cherry and Harvest Mahogany, which makes a striking contrast with the color of the metallic parts which have a brushed nickel finish. The optional candelabra bulbs are of 60 watts each, so you get a total of 180 watts of diffused white light if you take the candelabra option. The angulated swirled marble light shades have a simple design, but are pleasant to look at as well. The light shades are mounted at an angle to cast sufficient light across the room. With regards to technical features, the Hunter 53237 ceiling fan has a good sweep due to 52” blades. The fact that the fan has five blades instead of the usual four adds to the air flow. The air delivery, like with most of the Hunter Builder Plus series is entirely satisfactory. Another notable feature of Hunter Builder Plus fans is their trademark Whisperwind motors that are used, and the Builder Plus is no exception. This fan motor is robust and efficient, designed to last long with a lifetime warranty. Let us now touch on the topic of usability. It has three mounting positions – standard, low or angled mounting and the fan has three-speeds to select from. The on/off and speed functions are easily controlled by the pull chain that hangs freely from the center of the fan. The motor is reversible, which is an added advantage since this enables the fan to draw the air upwards during cold weather. Thus, you get air circulation without having cold air blowing directly in your face but at the same time, the warm air around the ceiling gets mixed with the cold air located on the floor. Robust motor with a lifelong warranty. The heavy gauge copper winding in a Hunter fan motor keeps the winding temperature low to reduce the risk of burning out. Silent operation of these fans is ensured by the completely sealed double ball bearings avoiding noise developing due to bearings running dry. Most customers are impressed by the absence of noise with Hunter 53237 fans. Pleasant colors of Brazilian Cherry or Harvest Mahogany are carefully selected to suit any décor. Easy installation. Some customers were even able to install the fan by themselves without too much effort. The blades of the Hunter 53237 fan are specially coated with a patented coating called ‘Dust Armor’ using nanotechnology. This suppresses dust build-up which is a recurring problem with ceiling fans. The bulbs are not standard and are not energy efficient. So, if you are looking to save on power bills, then the Hunter 53237 may not be suitable for you. There have been cases where the product arrived in damaged condition. However, to their credit, the company did send replacements promptly. Non-standard rods. You would do well to avoid a standard rod on a lower ceiling. Also, once the rod is screwed in, it is almost impossible to remove it. Difficulty installing the fan blades. Screwing the fan blades without help can be a bit tricky. You may wonder about why this particular brand of ceiling fan has gained so much popularity. Agreed there are cons as well as pros, but feedback is mostly positive. The fact of the matter is that a good ceiling fan is as good as the motor that drives it. That said, the Whisperwind motor that the Hunter 53237 fan uses and all the other models of the Hunter Builder Plus series is a well-designed one. A ceiling fan uses a motor which is rated as ‘continuous duty.’ This means that the motor should be capable of running even up to 24 hours continuously. For this, the temperature of the winding should not exceed a particular limit, or else the coils of the winding can get burnt out. Many factors dictate the running temperature of a motor, which is derived from the basic motor design. Apparently, the Whisperwind motor is a well-designed motor, hence long lasting. This is the main reason behind the undulating performance of Hunter ceiling fans. We delved deep into the various features of the Hunter 53237 ceiling fan. We have also studied the various elements that this product has to offer. 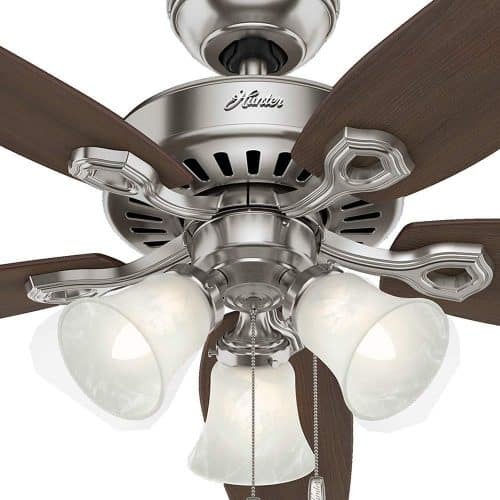 Through countless reviews, we highlighted the pros and cons of this ceiling fan. Where does this leave us? What can we conclude about this particular product? The Hunter 53237 ceiling fan is a product that you can buy. It has several useful features which are highlighted above. However, it is possible to get a defective piece. Taking the ‘pros’ as listed here, you will now be aware of what to look for once you receive your product. Hopefully, you shouldn’t face any inconvenience after buying the product. However, as with all products, this one too can have its ups and downs. 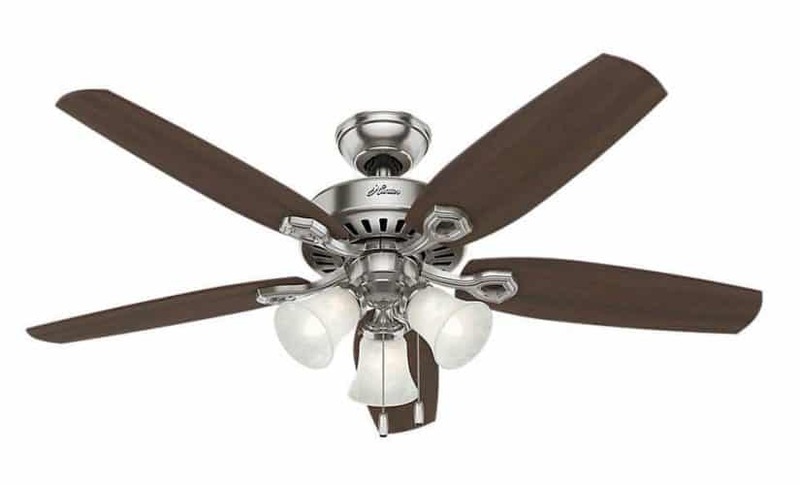 But the Hunter 53234 ceiling fan is definitely a product that you can proudly install in your home. How Are Ceiling Fans Measured? What Color Ceiling Fan Should You Buy? Which Way Should A Ceiling Fan Turn? Some recommended products may use affiliate links. HomeDecorSelection.com is a participant in the Amazon Services LLC Associates Program, an affiliate advertising program designed to provide a means for sites to earn advertising fees by advertising and linking to Amazon.com. Amazon and the Amazon logo are trademarks of Amazon.com, Inc or its affiliates.